Right now the coal business is arguably living through its most dire days ever. Nearly 300 mines have closed in the past five years, 200 coal-powered plants have been scheduled for closure, and coal corporations are basically ruined. 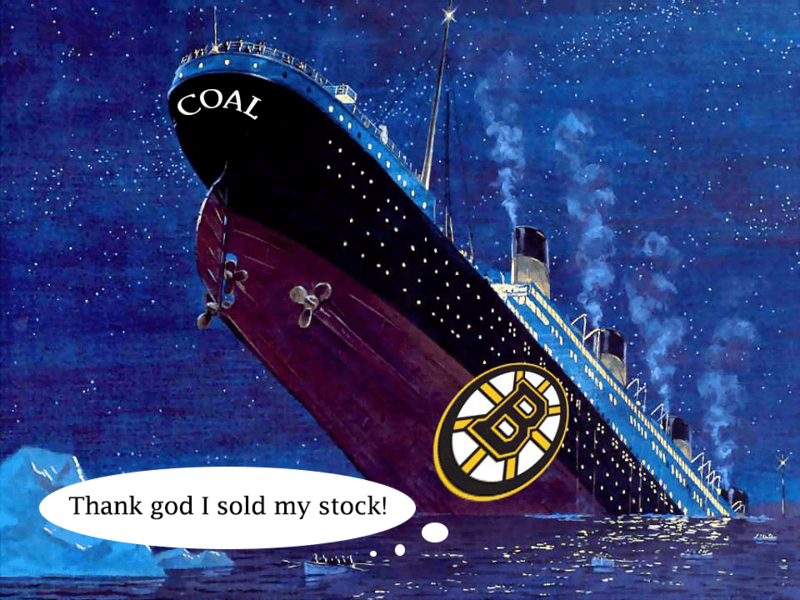 For instance, Peabody Energy, the world’s biggest coal company, sold stocks below $1 when it used to be $72 in 2011. And it could get worse. Alpha Natural Resources, the second biggest coal company in the US, filed for bankruptcy along with other smaller firms. Basically, investors wouldn’t touch coal nowadays not even with a ten-foot pole. Winter is coming, but apparently, coal companies execs aren’t all that stressed. While their employees have had their pays cut and thousands fired, managers and CEO have actually substantially increased their salaries. When the ship sinks, might as well grab what you can, I guess. The Institute for Policy Studies systematically analyzed the incomes of top execs working at the top 10 coal companies in the country. Execs had their pay increased an average of 8 percent between 2010 and 2014, despite these have been the worst years in their history maybe. Combined, these 10 companies lost 58% of their value. According to the report’s authors, this unjustified raise is accounted to the fact that stock-based compensation isn’t cutting it out anymore. Prior to 2010, execs were very happy to receive both cash and stock. Now, they just want cash seeing how stocks are becoming worthless overnight. Even so, the lucky ones at least, collectively cashed out over $100 million in stock options in this period, according to the report. “We’re seeing this move to insulate them from the implosion of the coal sector by handing out more cash,” said Sarah Anderson, the report’s author. Beating the S&P 500 average: CEOs of these 30 largest fossil fuel companies averaged $14.7 million in total 2014 compensation, over 9 percent more than the S&P 500 CEO average. Five years, $6 billion: These firms’ management teams have taken home $6 billion over the past five years. That would be enough to weatherize 3.3 million homes or double the $3 billion U.S. pledge to the Green Climate Fund, a new institution to help vulnerable nations address climate change. Short-termism: Most CEO compensation comes in the form of options and stock grants, a pay stream that encourages a fixation on pumping up share prices. Executives at distressed coal companies Peabody and Alpha Natural Resources cashed in stock options worth $47 million and $33 million, respectively, in the four years before their industry began to implode. 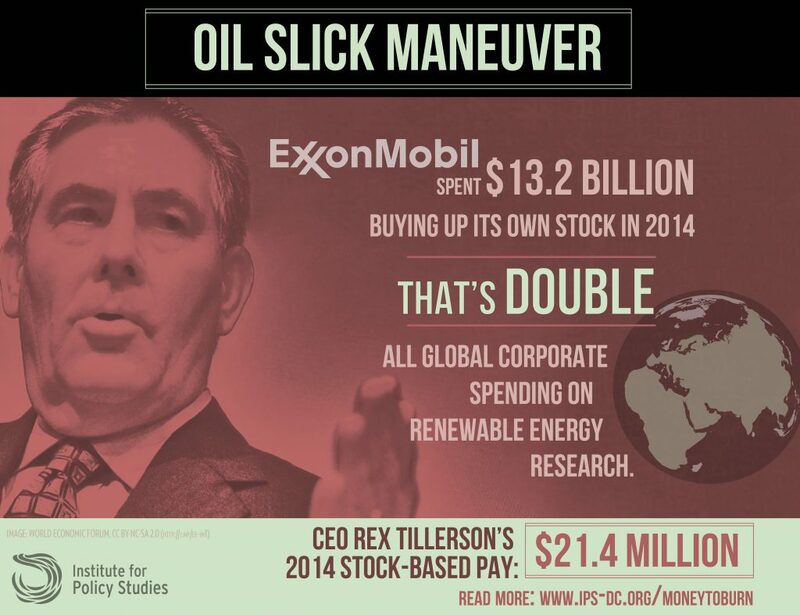 Buybacks: In 2014, 23 of the top 30 fossil fuel companies spent a combined $38.5 billion on share repurchases. That was six times global corporate spending on research into renewable energy that year. Buybacks artificially inflate share prices, which, in turn, inflates executives’ stock-based pay. Pay for non-performance: The top 10 publicly held U.S. coal companies have also been increasing their cash-based executive pay as their share prices have been plummeting. When paychecks grow even as businesses sink, executives have little incentive to shift to a new energy future. 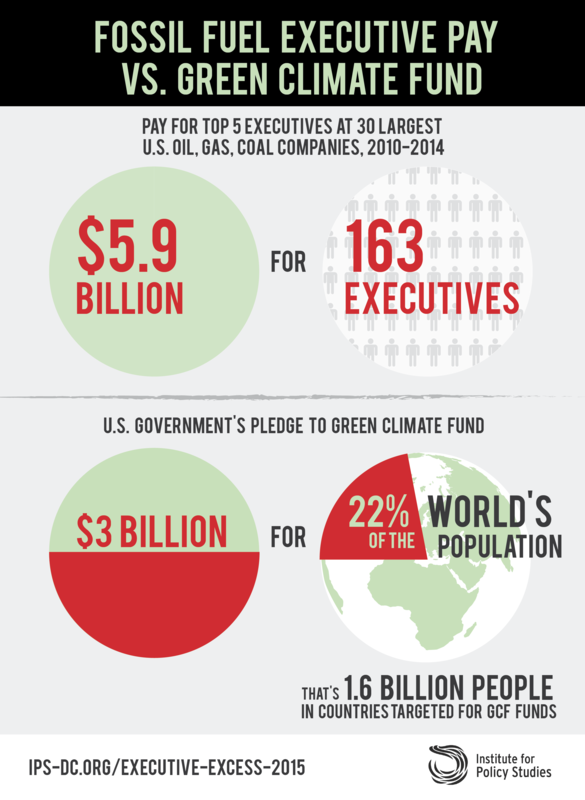 Bonus incentives: All 13 oil producers on our list of 30 major U.S. fossil-fuel corporations reward executives for expanding carbon reserves. Retirement security: Top fossil fuel executives have accumulated company-provided retirement assets worth a combined $1.2 billion at the same time their indifference to environmental degradation has been putting the futures of ordinary people at risk. “You might think that the leaders of coal companies would be made to pay the price for these failures. But in the perverse world of American corporate compensation, they are, in fact, getting a raise,” wrote Tim McDonnell in an article for MotherJones. I’m not feeling sorry for the fossil companies, don’t get me wrong. The point the report makes, which I’d like to reiterate, is that this whole ship is sinking. Secondly, fossil executives care little about their employees or company for that matter. They don’t have a mission. They don’t want to change the world. They just want to stay fat.